Milos beaches are one of the main reasons to visit the island. You will find plenty of beautiful sandy beaches, but you will also be enchanted by some of unique coves, caves, and swim holes. Brave souls dive from the rocks in Sarakiniko beach. Sea caves and a wreck complete the scene. Milos island, Greece. Ahivadolimini beach is a very pleasant place to swim. Paliohori beach is large and pleasant. The sand is of the “sticky” kind. Pahaina beach is a gentle and quiet beach. It’s perfect for families with small children. Alogomandra beach is not as well known, but it is well worth a visit. The only sandy patch at Sarakiniko beach, Milos, Greece. The beach of Pollonia town is popular with families. Milos island, Greece. Colorful cliffs flank the busy end of Provatas beach. It’s less busy on the other side. A swimming hole in Kapros. Milos island, Greece. Firopotamos beach is very quiet. Milos, Greece. Ahivadolimni beach is vast. Milos island, Greece. Amenities: You will find a restaurant on the beach at the west end. Panoramic view of Alogomandra beach. Milos, Greece. Amenities: There is not much around the beach, so bring your own food and water. Notes: Alogomandra is a very nice beach. It could be a “featured” beach in any other island, but in Milos it competes with the ones that offer more spectacular settings. On the east end of the beach you will find a shallow cave lined with soft sand. If you like sandy beaches with no crowds, this would be an excellent choice when you are in Milos. The dramatic colorful cliffs frame Firiplaka beach nicely. Milos island, Greece. Access: A rural dirt road will bring you close to the beach. You have to share the road with mining trucks, so pay extra attention when you drive there. You have to park high on the road and then walk about 5 minutes down to the beach. This short hike is an easy one. Amenities: You will find a small restaurant on the beach, and you may hire parasols, but there is not much else for a few kilometers. Notes: Firiplaka is a popular beach with younger crowds, but you will find plenty of families in the mix. The colorful cliff that frames the beach and the large rock in the water give it a distinct look. At certain times, the currents seem to deposit large amounts of seaweed on the beach. Seaweed is not harmful, but it doesn’t feel good swimming in it (unless you are an otter). Access: You can reach Firopotamos via a rural paved road. Theres is usually plenty of parking near the beach. Amenities: You can easily walk into the small town from the beach. You will also find parasols for hire, and restaurants right on the beach. 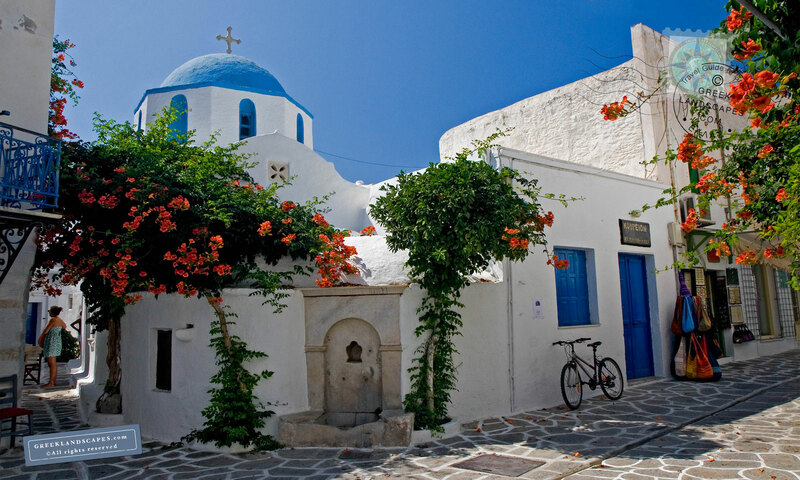 Notes: Firopotamos has the charm of a traditional fishing village. 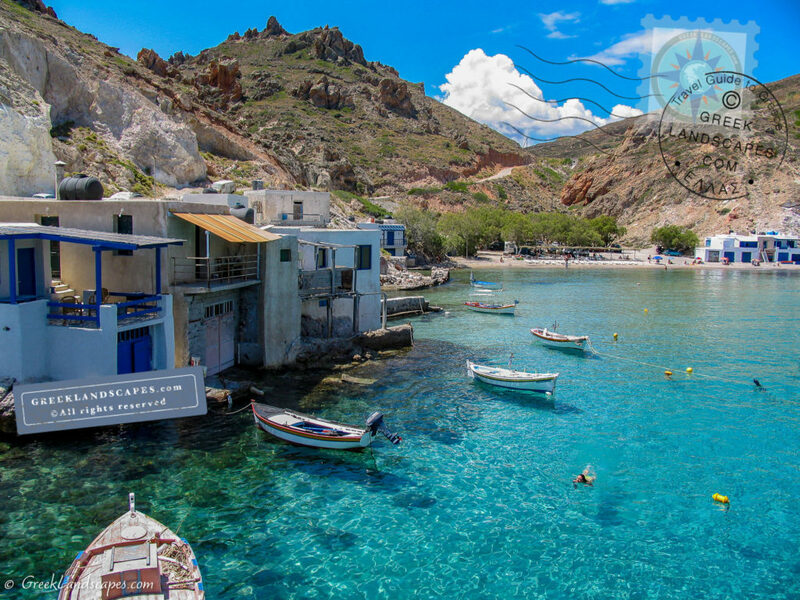 While the beach itself does not have the beautiful sand of Firopotamos, or Tsingada, the tranquil town is well worth a visit when you are in Milos. Access: A dirt road built for mining trucks will bring you close to Gerontas. You have to climb down a dirt path to the beach. Notes: The beach is out of the way so it does not get too crowded. Snorkeling around the rocks is good, and the dramatic rock arch at the west end is photo-friendly so don’t forget your camera or your snorkeling gear. The small beach of Kapros at the end of the cove (left). A swimming hole is visible on the right. Access: Kapros beach is near the main road, so it’s easily accessible. Amenities: There is not much around the beach, so if you plan a long day, brin your own water and food. Notes: Sometimes Kapros beach is confused with the nearby Papafragas. That’s because the two places share a similar landscapes with rough rock, small caves, rock arches, swimming holes, and tiny sandy patches to spread a towel or two. Access: You can get to Pahaina beach via a rural paved road. There is plenty of parking nearby. Amenities: There is not much around Pahaina, so bring your own water and food. Notes: Pahaina (or Pahena) beach is a cozy sandy patch that doesn’t share the fame of adjoining beaches of the island, but its a wonderful place to swim with warm sand and shallow waters perfect for children. Access: A paved road will get you right to the beach. There is plenty of parking nearby. One of several swimming holes in Papafragas, Milos island. This arch and the carved chambers above is what you see from the sandy beach at the end of the cove that opens to the sea under this arch. 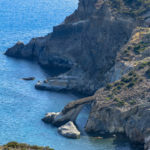 The small beach of Papafragas is on the cove to the left. A sea cave is visible to the right. Beach Berm: There is a small sandy patch where maybe 10 couples can lay their towels side by side. From there you may explore the surrounding coves and caves. Getting to the water from the parking lot requires going down a few very precarious steps carved into the rock. Not impossible, but you have to be careful and have steady shoes. Access: Papafragas swimming holes is near the main road, and there is parking right on top of the small beach. Amenities: There is nothing within walking distance so bring your own food and water. Notes: Papafragas is the most appealing of a series of coves that carve the volcanic rock near the archaeological site of Filakopi. The sandy patch at the end of a long and completely enclosed cove can only accommodate about a dozen people, so going early in the day would be a good idea. The cove opens up to the aegean through a picturesque arch. If it weren’t so close to the main road, it would have been one of the most romantic little beaches of Greece. Papinikou is a pleasant beach near Adamas. Milos island, Greece. Access: The main road south of Adamas runs parallel to the beach. Amenities: There is a restaurant or two at the beach. 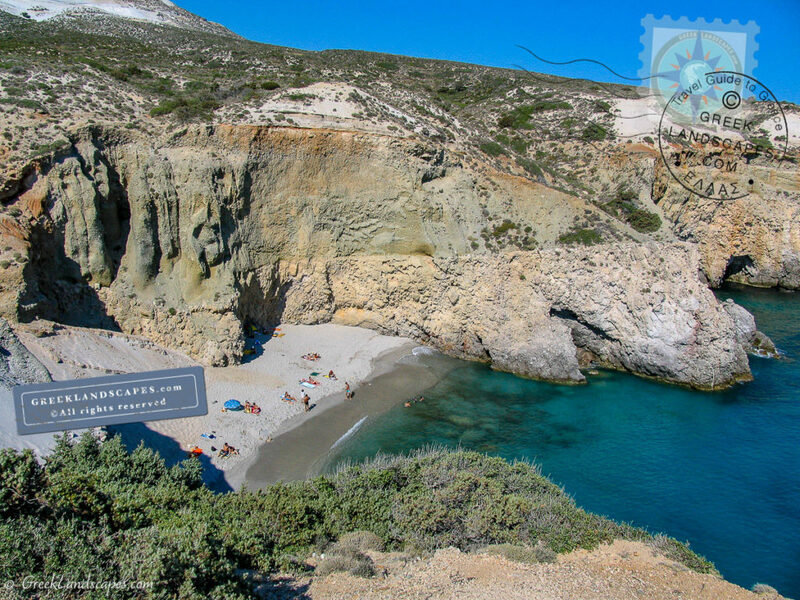 Notes: Papapikinou is the first beach you encounter as you drive south of Adamas, Milos island’s main port town. Compared with the other beaches of Milos is an average beach, but by no means a bad place to swim if you cannot drive any farther, or if you are waiting for your ferry and don’t want to venture too far from the port. Access: A good road will bring you close to the beach. Amenities: The town of Pollonia is within walking distance from the beach. There you will find restaurant, grocery stores, cafeterias, etc. Notes: Pollonia is a pleasant beach lined with soft sand and framed by a small town that caters to tourism. he beach gets more crowded near the port (ferris to Kimolos leave from Pollonia) where all the restaurants are, but it’s very quiet farther west. It’s a nice beach for children and there is even a well maintained fenced playground nearby. Access: A poorly maintained road (partly dirt road) will bring you to the beach. Amenities: There is a restaurant at the beach, and lots of parasols for hire. Notes: Provatas is a nice beach but the drive there is not the most comfortable. Part of the beach is busy and lined with sun beds, but the other side is parasol-free and you can find more space there. Sarakiniko is the iconic beach of Milos island. Greece. 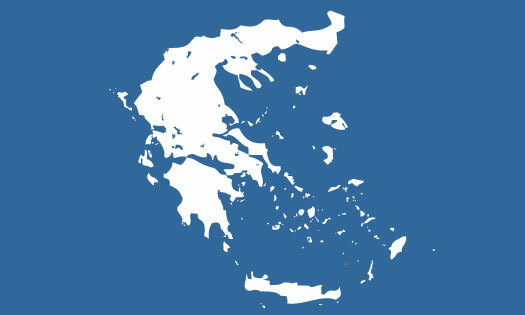 Sarakiniko in Milos island. Greece. The water inside the cove in front of the sandy beach collects debris and becomes murky in the afternoon hours. It is much clearer in the morning. Further out the water is pleasant. Beach Berm: Sand and rock. While there is a tiny beach nested among the sculpted rock, most bathers prefer to lay their towels on the smooth limestone rock that makes up the landscape. Access: You can get to the beach via the main road, but you have to park far. The 5-minute walk to Sarakiniko from the parking is comfortable and easy. Amenities: There is nothing within walking distance, so bring your own water and food. 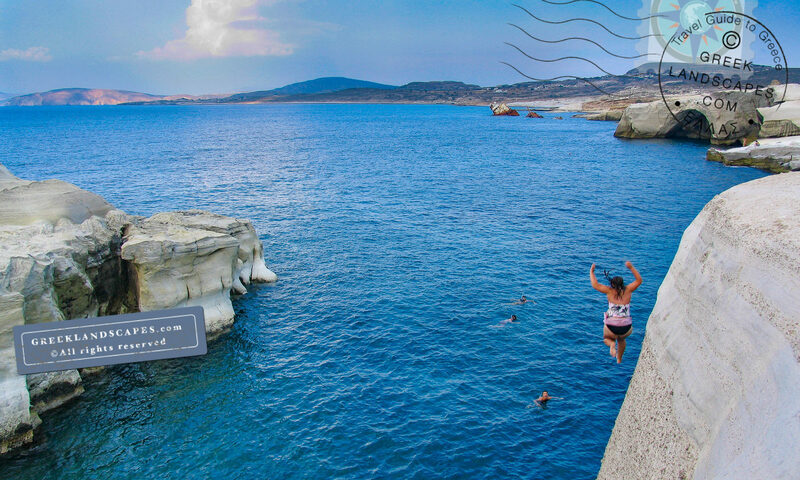 Notes: Most bathers gather and lay on the smooth rocks, while some dive in from high cliffs. Sarakiniko is a beautiful landscape with wind-sculpted rock and interesting sea caves to explore. Some man-made caves (like catacombs), a decaying ship wreck, and several tiny rocky islands complete the dramatic scenery. While you can find softer sand, bars, restaurants, and organized beaches elswhere in the Greek islands, Sarakiniko stands alone in it’s unique composition of sensous stone and raw beauty worthy of another famous landmark found in the island: Venus de Milo. There are several other beaches with the name “Sarakiniko” in Greece. The name probably refers to the secret hideouts of pirates (Saracens). Sarakiniko beach in Elafonisi island is also one of the best in Greece, while another Sarakiniko in Preveza prefecture is also a very nice one. 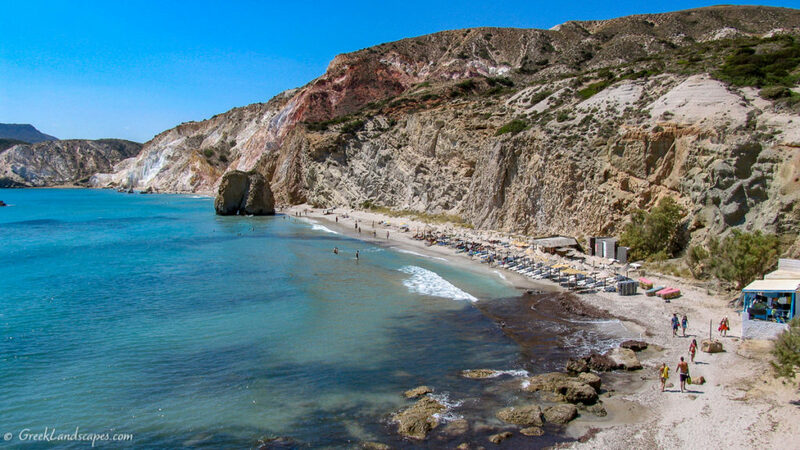 Tsigrada is one of the best beaches in Milos. Access: The paved road will bring you near the beach, but getting down is a bit more challenging. Getting to Tsigrado beach is not dificult, but you have to park high up on the road and then find a way to walk down to the beach. Getting back up to the road is harder because you have to climb over a steep sand/small rock terrain. Amenities: There is no amenities within a few kilometers, so bring your own water and food for the day. Notes: The climb down to Tsigrado beach is keeps the crowd numbers down, so usually it’s a very pleasant place for swimming.